European Union joins international leaders in condemning the killing of a Palestinian Arab teenager, assuming it was an act of revenge. The European Union has joined international leaders in condemning the killing of a Palestinian Arab teenager, saying it was "extremely concerned" about the potential for more violence. 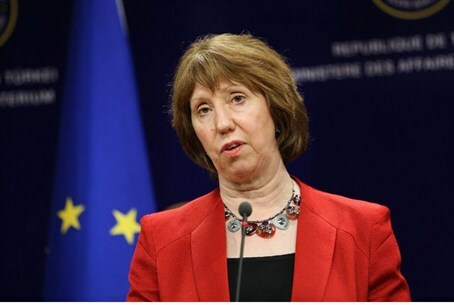 "We condemn in the strongest terms the killing of a Palestinian boy in Jerusalem," EU foreign affairs chief Catherine Ashton said in a statement quoted by AFP on Wednesday. "The perpetrators of this act must be brought to justice," she said. Ashton urged Israelis and Palestinian Arabs to exercise "maximum restraint" in the wake of the deaths. "We are extremely concerned about the latest developments which increase the risk of further escalation," she said, according to AFP. Ashton’s condemnation assumes, as did other international condemnations, that the murder of 16-year-old Mohammed Abu Khder was revenge for the murder by Hamas terrorists of three Israeli youths. The United States condemned the killing earlier Wednesday. "There are no words to convey adequately our condolences to the Palestinian people," Secretary of State John Kerry said in a statement. In his statement, Kerry condemned the killing in "the strongest possible terms." He said it was sickening to think a young boy could be "snatched off the streets and his life stolen from him and his family." President Barack Obama's national security advisor Susan Rice said on Twitter that the murder of Abu Khder was "heinous" and called on both Israelis and Palestinian Arabs to avoid a cycle of retribution and revenge. French President Francois Hollande, while also calling for "the utmost restraint," also refrained from assigning blame. A statement released from the Elysee Palace said Hollande "condemns in the strongest possible manner this heinous crime and sends his condolences to his family." UN chief Ban Ki-moon called for justice over the "despicable act", while joining British Prime Minister David Cameron and the International Committee of the Red Cross in condemning the killing. While there has been speculation that the youth was murdered by Jews as a possible act of revenge after the kidnapping murder of the three Jewish teens, there have also been reports that the abduction was carried out by Arabs and that the murder was an "honor killing" or another kind of criminal murder.